Situated in the Alsace Region of France is a picture-perfect, mountain-top castle straight from the Middle Ages. 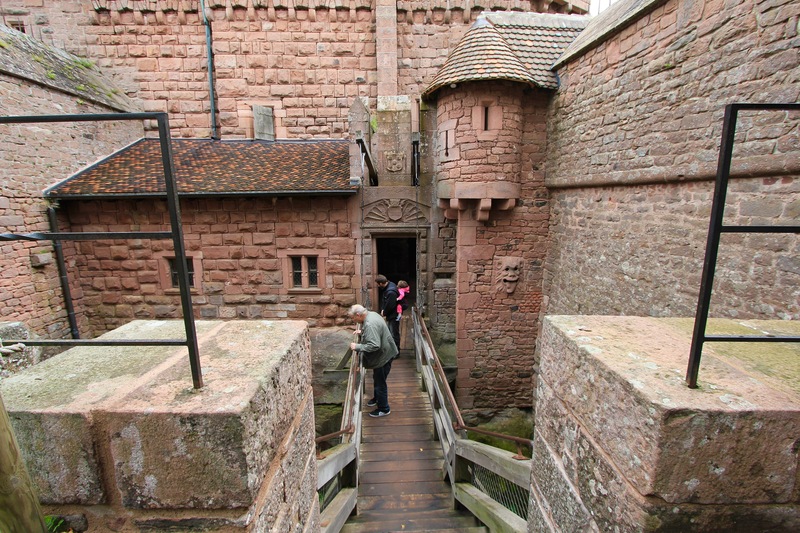 Visiting the castle, Haut-Koenigsbourg, you are instantly transported back to a time of knights, peasants, and nobility as this medieval castle is absolutely a wonderful place to visit with some amazing views of the Rhine River Valley, and even as far as the German Black Forest. The Alsace Region is very unique in France, as this area has changed hands many times between the French & Germans (of course, never on pleasant terms). The result is an area that is rich in both French & German culture that even today the native language spoken in the Region is technically French, but with a pronounced German dialect. 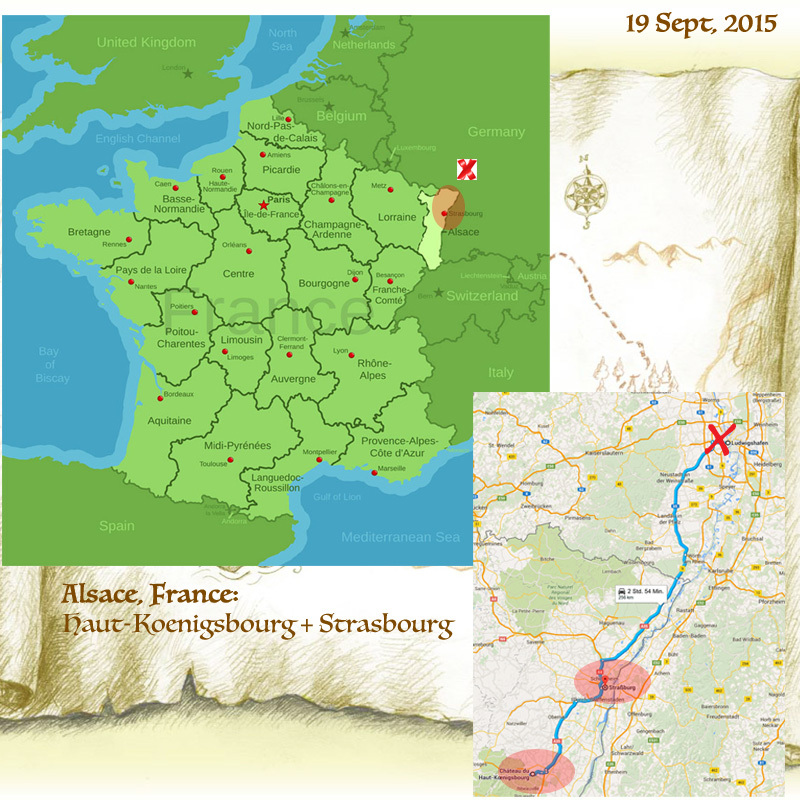 It is an hour drive from where we live in Mannheim, Germany to the Alsace border of France. 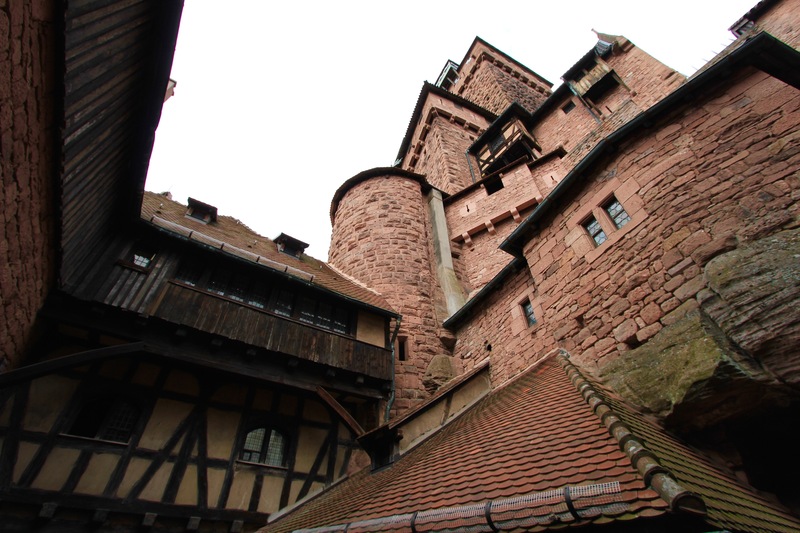 Then, another hour’s drive southwest to the castle of Haut-Koenigsbourg. 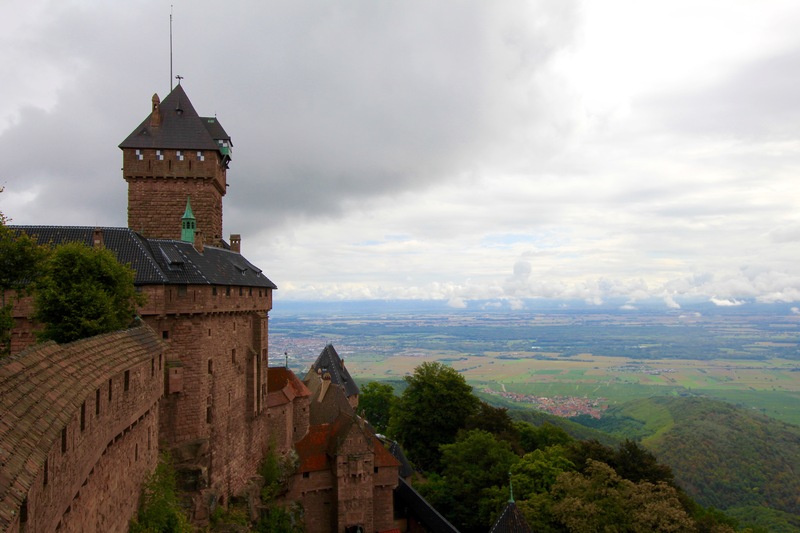 This castle is called “Haut-Koenigsbourg” which translates to “High Royal Castle”. Construction started in 1147 — about 900 years ago. For more information about this castle, checkout their website here. To reach the castle, you drive through the Rhine River Valley, which is very flat with farm lands and vineyards. The Valley is bordered on its western edge in France by a mountain range called the Vosges Mountains. On one of the first peaks just 30 minutes outside of the city of Strasbourg, stands this castle at an elevation of 757m (2500′). Its position gave a great view of invaders from the Valley below. 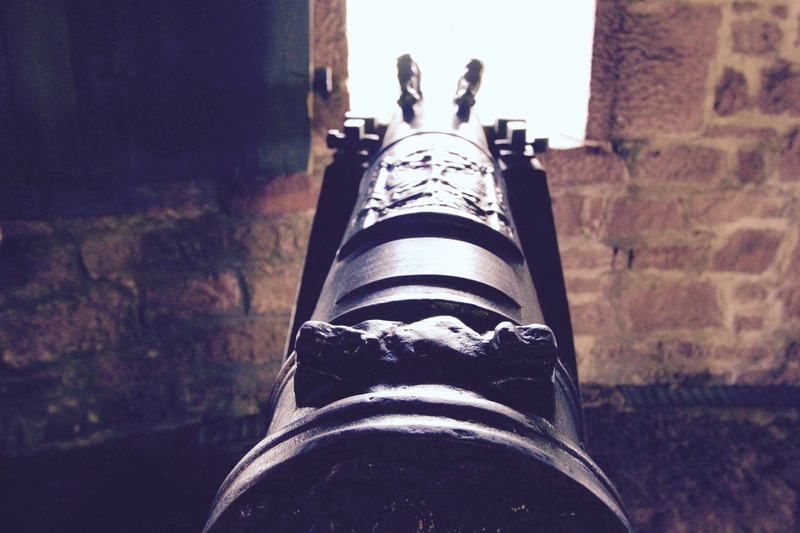 The castle was eventually destroyed during the Thirty Years’ War, which was a war waged between Protestants & Catholics…and, by war — I mean real combat, not a religious debate! In fact, the Swedish had aligned themselves with the German Protestants to fight against the Holy Roman Empire (Catholics), and a result was the burning & destruction of this castle. For 200 years, the castle lay in ruin atop the mountain. 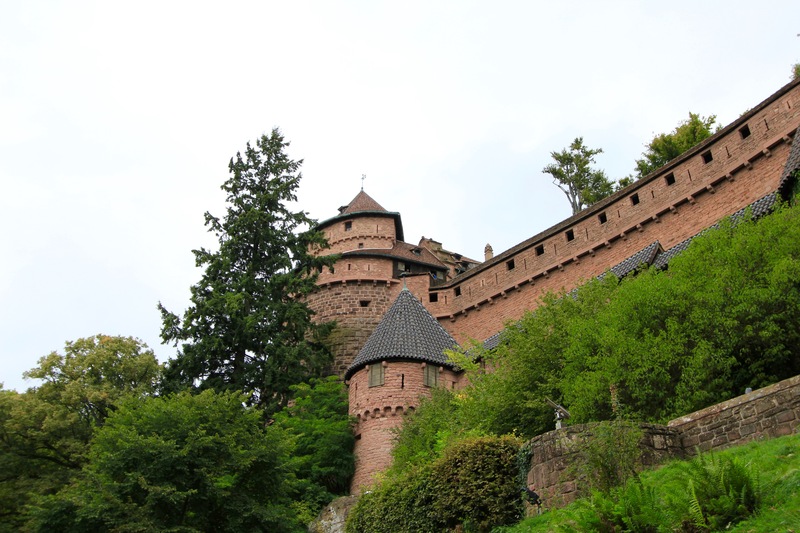 In 1871, the Alsace Region was annexed by Germany, and the nearby town of Selestat offered the castle area to Kaiser Welhelm II, who was the last Emperor of Germany, responsible for forming the German Empire. With the new land and to show dominance of his region, Kaiser Wilhelm set out to restore the castle in its original 12th century design. This was to be started in 1899 and completed in 1908, as a symbol of German pride on the western most edge of its lands. 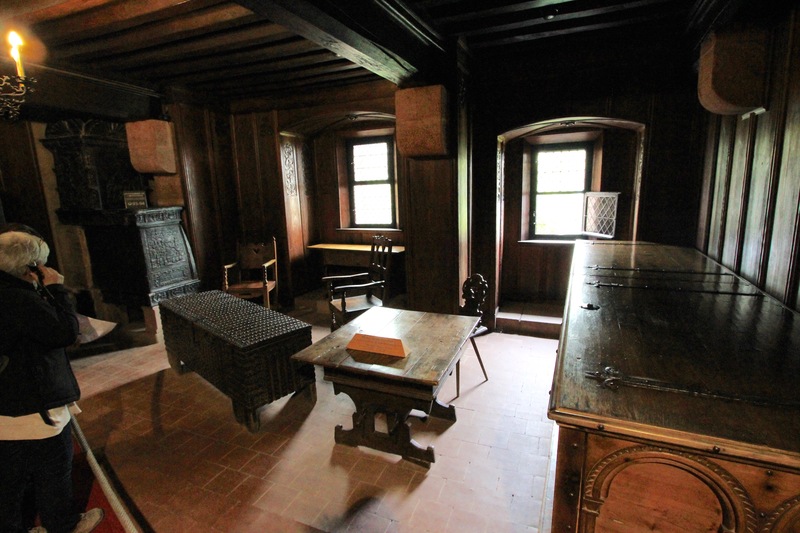 Pictures of the reconstruction can be found here at the castle’s website. 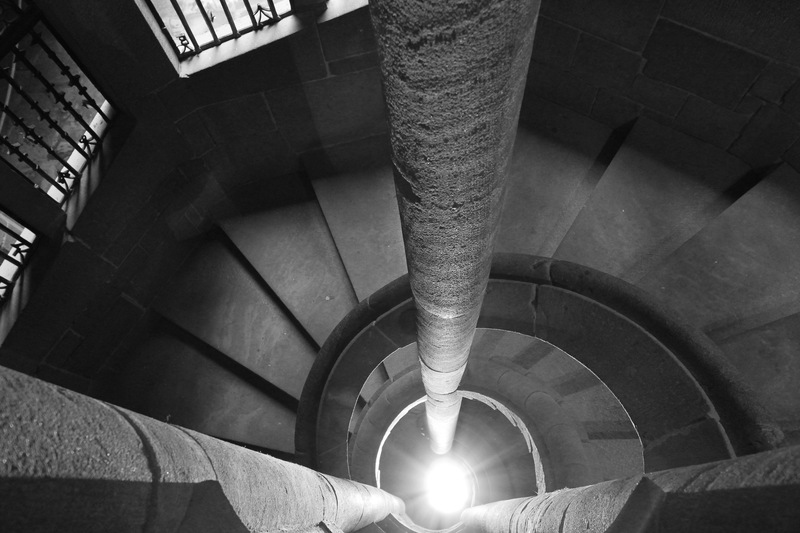 If you have ever visited any medieval castle, you no doubt have encountered spiral staircases. Have you ever wondered why do castle spiral staircases turn in the “clockwise” direction going up? They do so for defensive purposes, since most people are right-handed. Therefore, invading soldiers entering the castle trying to get inside most likely carried their weapons in the right hand. As the staircase spirals in the clockwise direction, the walls of the stairs above block their hands from swinging their weapons. Conversely, those guarding the castle coming down carrying weapons in their right hand are not blocked by the walls and have a better chance of hitting their opponent. I know…things that make you say, “Hmmm”. Inside one of the living spaces with replica, period furnishings. 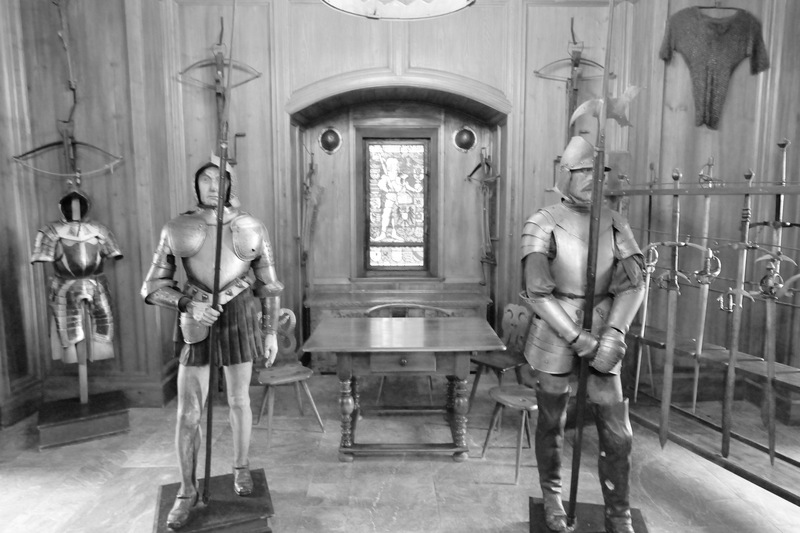 The main dining room of the castle has a very large wooden table and furnishings that are original since the 1908 reopening of the castle. Murals painted around the room depict various themes of religion and German conquests. Above the table is a chandelier with deer antlers mounted within it. 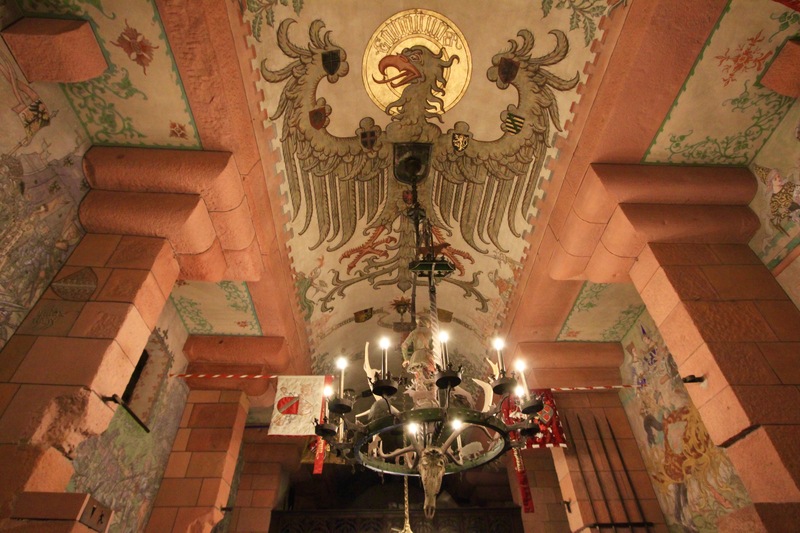 On the ceiling is the “German Imperial Eagle” that was used by Kaiser Wilhelm as a symbol of unity for the German Empire from 1871to 1918. 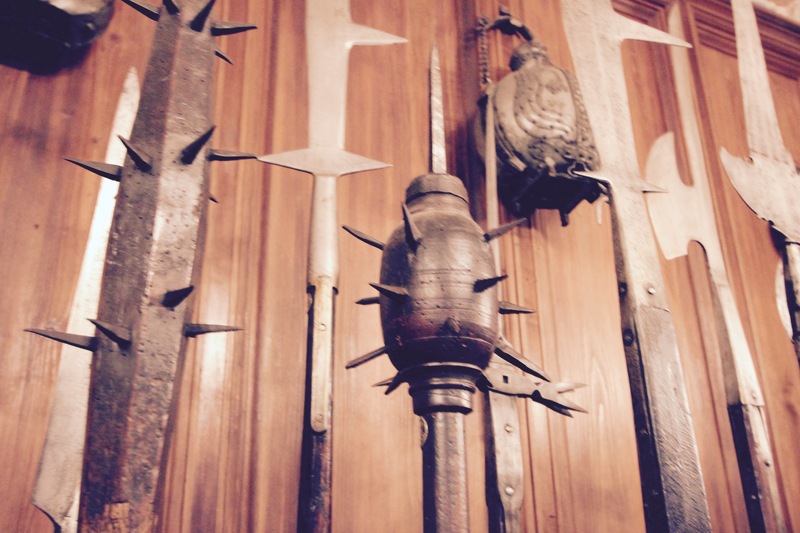 Inside the armory of the castle there are replica knights with armor who would defend the castle, along with the various weapons one would have expected to see during the middle ages. Going outside from the upstairs living quarters is a draw bridge that crosses a small gorge over to a garden area within the castle walls. This was one line of protection in the event invaders had made it over the wall on one side of the castle, they still had to cross the gorge to the residence area of the castle. So, the castle started construction in 1147, was destroyed in 1633, and rebuilt & opened in 1908, and luckily did not sustain any damage from the following two World Wars. Today, the castle stands above the French farmland below along the Rhine River Valley. If it would have been a clear day, we could have seen the German Black Forest in the distance and the Alps along the horizon. 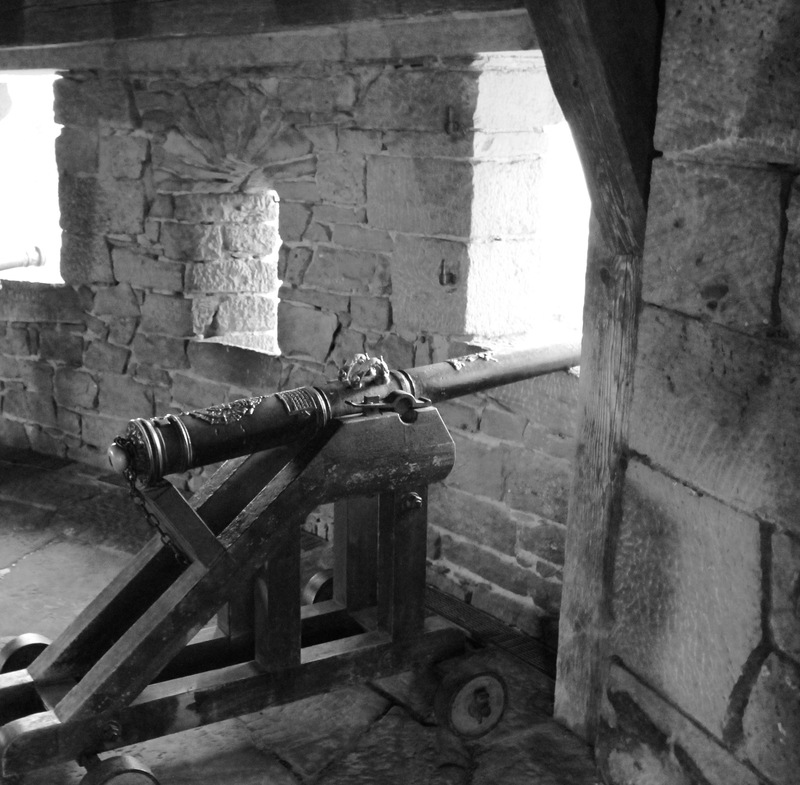 To show that this castle had a military presence, original cannons that would have been used in the 17th Century during the Thirty Years’ War, are on display at the top of the lookout towers of the castle. 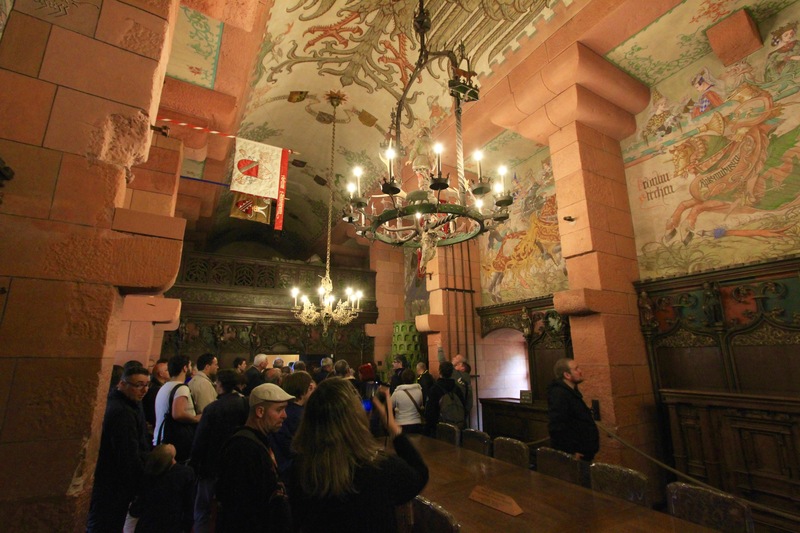 Visiting the Haut-Koenigsbourg is a fascinating look back to the Middle Ages and castles in that era. Getting here from Strasbourg is very easy, and worth the 1/2 day trip if you are visiting Strasbourg. After visiting the castle, we spent the afternoon in Strasbourg, and our post about Strasbourg can be found here. Europe is full of medieval castles that still stand today. 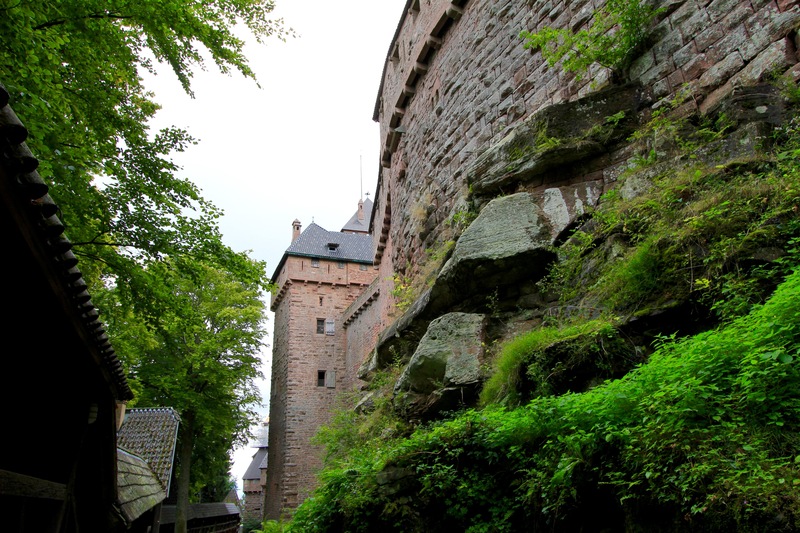 While you can travel the Rhine River in Germany and see dozens of castles, the Haut-Koenigsbourg Castle in France, is definitely worth the visit to travel back in time to the Middle Ages. A very nice written and picture tour of the area. Thank you for your time and effort putting this together to share. Thanks, David. It was a lovely visit, and I am happy to hear our description of this place is well received. My family lived in this castle for centuries. Then one day, angry villagers with torches came….